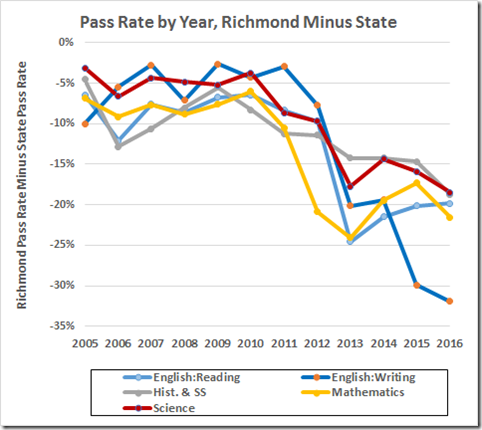 Richmond’s public schools have a spectacular record of failure. 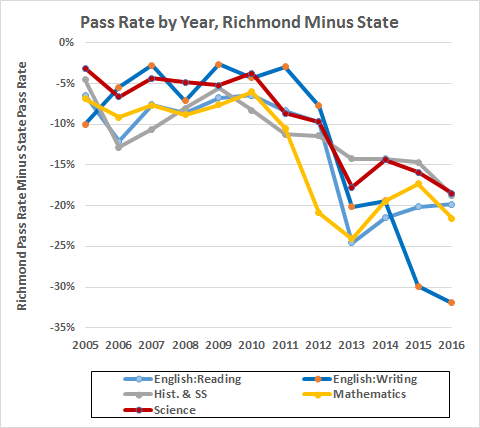 Before the new math tests in 2012 and the new English and science tests in 2013, the Richmond pass rates were merely awful. Since then, the rates have been perfectly appalling. Indeed, since the advent of the new tests, only Richmond’s reading scores have improved vs. the state average but even the reading pass rates remain behind by 19.9%. The history & social science scores have dropped, both before and after the new tests in the other subjects. Our new Superintendent had a chance to shine in 2015: His predecessor had failed to align the curricula to the new tests. Simply by doing his basic job, Superintendent Dana Bedden had a chance for a bounce in the scores. Bedden started here in January 2014, so we can look for the Bedden Bounce in the ‘14-15 numbers. The data above perhaps show a bounce in math that year, undone by a drop in 2016; otherwise no bounce. More details here. Bedden points out that change is disruptive and, in the short term, the disruption will look like failure. For sure, the current numbers look like failure. This year, Bedden suggested and our (soon to be former) School Board requested a “division-level review” by the Board of Education. That Board granted the request. To place that request in context, we should notice that our Board of Education has a spectacular record of failure in achieving compliance with the Standards of Quality. The paradigm is Peabody Middle School in Petersburg. Peabody has been failing since at least 2002; Petersburg has been operating under Memoranda of Understanding with the State Board since at least 2004 (video of 9/21/16 at 1:48:30). 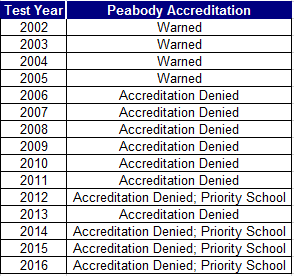 Peabody still is unaccredited. The Board of Education has the authority to fire a superintendent for cause and to sue a school district for failure to meet the Standards of Quality. It has never done either, even in Petersburg. We now know why. Consistent with their record of failure, they don’t know how to fix broken schools (Sept. 21, 2016 video starting at 1:48). If they were to sue, they would have to tell the judge what the school division must do to meet the standards. Since they don’t know, they wisely don’t sue. I. Richmond’s schools improve and the division achieves accreditation. Bedden takes credit for getting needed help and fixing our broken schools. He demands a raise. II. More likely, Richmond’s schools continue to fail. Bedden points out that even the State can’t fix our awful schools and he’s done everything humanly possible. He demands a raise.